Reserve Your Seat be contacting: Amanda Griggs at 507-896-2165 or griggsamanda1@gmail.com . 8:45 a.m. in Wabasha ­ City of Wabasha overflow parking lot across from Supervalu. 9:45 a.m. in Red Wing ­ Target Store parking lot just off Tyler Road on the north side of town. 10:40 a.m. Arrive at the Capitol. Tonight’s the night — be there or be square! Tell the Red Wing City Council what you think about having the “voice of frac sand mining” as Mayor of Red Wing. Should he be allowed to remain in office until April Fools Day? 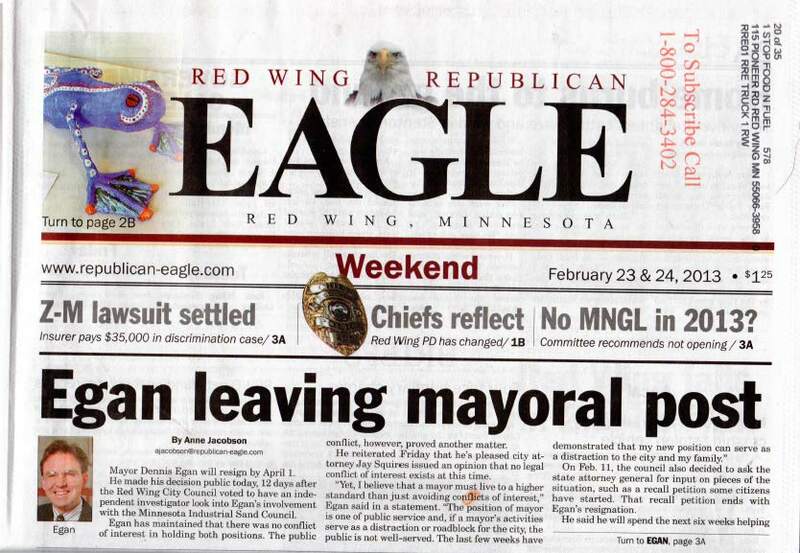 Tonight the Red Wing City Council will be addressing the Mayor’s offer to resign as of April 1, 2013. April Fools? I hope not. IS HIS RESIGNATION IN WRITING? There’s no reason to wait so long — he should resign immediately. He should resign before the legislative session goes any further. He should resign before any meetings where he’d be going to represent the City of Red Wing. He’s tainted. This is about character, and he’s had many opportunities to display his character, and what I’ve seen is disturbing. If he doesn’t resign, he should be booted out, as the City Council has power to do under the City Charter. The agenda item about Dennis Egan begins at 36:13. Dennis Egan’s comments 51:26 – 1:03:55. Throughout, he remains resolutely firm in stating there is no problem with his actions, and very long-windedly states when put on the spot, that he will not consider resigning. No direct answers. Egan said he talked to City Administrator Kay Kuhlmann before signing his employment contract last week with the sand council. He declined to say how much the group is paying him. “She didn’t raise any red flags at that time,” said Egan, who was re-elected in November to a four-year term. Kuhlmann did not return a phone call Tuesday afternoon. Egan said he informed Red Wing City Administrator Kay Kuhlmann of the job offer prior to accepting; Kuhlmann was not available for comment. He seems to be using her to hid behind, that “She didn’t raise any red flags at that time,” and that he “informed” her “prior to accepting.” Maybe that conversation didn’t happen, she wasn’t informed, and she’s collateral damage. Maybe he’s dropping her name to help bolster his position. Whatever occurred, he’s putting her in a bad position. What was that conversation, the subject, the date, what all did he disclose to Kuhlman? The City Council and the public should know. Hmmmmm, my comment disappeared… here we go again: It’s not just Egan’s duplicity that’s on the Council agenda Monday, the city’s legislative position on frac sand mining is also to be decided. There’s a lot of passive and minimizing language in this article. Egan didn’t “find himself” lobbying for frac sand mining interests, he put himself there. He didn’t disclose to the Council, nor apparently did Kuhlman. Administrator Kuhlman is not an attorney or does a City Administrator have any authority regarding conflict-of-interest issues — to not raise the impropriety of Egan’s actions brings Kuhlman’s ethics into question (though we don’t know much about their discussion). Recusal by Egan is not sufficient. It’s time to resign. That he doesn’t regard it as improper is astounding. Egan may not care, but this constituent and many others do. Maybe after Monday’s City Council meeting he’ll have a sense of the ethical issues and the line he’s crossed. The bottom line is that Not-soon-enough-to-be-ex-Mayor Dennis Egan did not disclose to the City Council. If Not-soon-enough-to-be-ex-Mayor Dennis Egan did disclose to City Administrator Kay Kuhlman, she did not disclose to the City Council. If he’s tossing her name around to bolster his position and he didn’t disclose his position to Kay Kuhlman as he said he did, then it’s even worse for him. Because he raised this issue so defensively right out of the gate (CLICK HERE, at 51:26), I think there’s more going on here. What’s the rest of the story? This is about character. This is about Dennis Egan’s value system. Dennis Egan has demonstrated his character and value system, and he is not fit to be Mayor. He should not represent the City in any way. Timing is important. 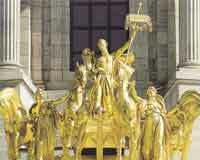 The legislature is in session and will be until after April 1, 2013. Egan should not be Mayor while a registered lobbyist for the frac sand mining industry. I believe there is a national conference in March that Egan is to attend representing the City of Red Wing, and if so, the City should send someone else. Tonight — 7 p.m. February 25, 2013 at Red Wing City Hall. Be there or be square. Mayor Egan to resign? Sand mining bill introduced! YES!!! Making progress today on two fronts in the frac sand world here in Red Wing and in Goodhue County!! First, Mayor Egan has announced he WILL resign, but he hasn’t yet. Second, there’s a draft bill circulating that regulates sand mining and which mandates an EIS, and I’ll post a more detailed review of that soon. But the problem here is that Dennis Egan shouldn’t wait for a month to resign — Egan should resign NOW! Way down at the bottom of this is a good editorial from Richard Johnson, a former County Attorney, who was ejected from the Council meeting. He was outraged at the Council’s lack of a backbone, understandably! (I missed the meeting, couldn’t be there, was on the train almost to L.A. then, and trains have to be booked 6 months in advance to get a decent price.) The week of hasty communications before the Council meeting seems to have been worthwhile, seems to have been heard. It took a while, though, for them to get wound up. There are a lot of us here in town utterly disgusted by Egan’s lack of judgment and is inability to see that it’s a problem. Seems that the Council and us voters pushed hard enough to make it impossible for him to continue. His statements are still statements of denial, more evidence of the depth of his cluelessness (I’m struggling for words here!). Let’s hope this resignation plan isn’t an April Fools gag. Red Wing City Council, GET IT IN WRITING! Mayor Dennis Egan will resign by April 1. He made his decision public today, 12 days after the Red Wing City Council voted to have an independent investigator look into Egan’s involvement with the Minnesota Industrial Sand Council. Egan has maintained that there was no conflict of interest in holding both positions. The public conflict, however, proved another matter. He reiterated Friday that he’s pleased city attorney Jay Squires issued an opinion that no legal conflict of interest exists at this time. There are some issues with this, particularly regarding local control. This bill doesn’t do nearly enough to preserve the rights of local governments to do set their own more stringent regulations, it allows it but needs to clearly state that the local more stringent regulations are controlling — if not we’re in the same mess we wound up in on the Goodhue Wind project. Also, it sets a one year limit on the EIS preparation time, and from the transmission projects I’ve worked on, it may well take more than that. It does not include Chisago and Washington Counties… But this is a draft, there’s plenty of time to work on it. More on that in a bit. A City Council member confirmed that Dennis Egan will step down, and said the council will drop its investigation plan. This one rates a WOW! 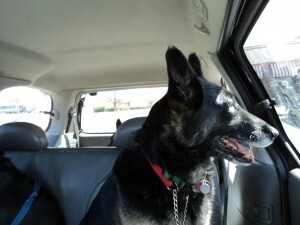 The rescue we got Kady from was raided yesterday. K-K-K-KADY!!! Reports state that 35 or so dogs were removed. Their Petfinder list of available dogs is now not working. There have been issues before between the PA SPCA and 6th Angel about doing an exchange of animals in a parking lot (what rescue doesn’t do that?) where the Pennsylvania SPCA had confiscated dogs from her, because it is against the law to sell animals in a public place, and I posted on that here. When we got Kady from 6th Angel, we had to fill out an application, have a house visit, references were checked, and we got her! She fit right in, snoozing right next to Ken or even in bed with her! So when you listen to that story embedded above, note how they’re saying she “posed” as a rescue. What’s that about, she was indeed a rescue. 35 dogs in one place and probably without a kennel license is a problem, but it feels like there’s something else going on here. 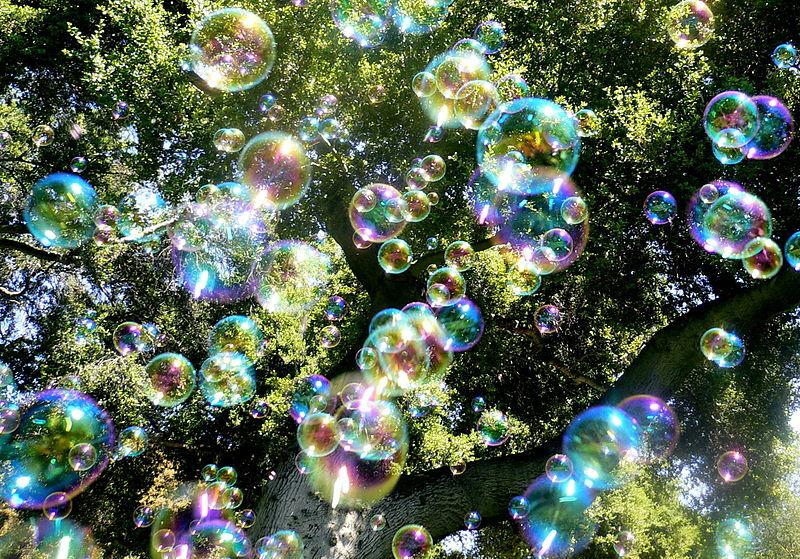 Shale Gas bubble about to burst? What are we getting into? Lots of drilling, lots of fracking, plus lots of frac sand mines already running in Wisconsin and a few mines and many mining proposals here in Minnesota… I’ve seen the problems with contamination of wells from fracking, and with earthquakes in Ohio from injection of fracking waste water. From here, it seems likely that the destruction will catch up with the gas extractors and it will all blow up. But in addition to the no-longer-possible-to-ignore physical problems of water contamination, earthquakes, and empoundment failures, there are economic problems too. Electrical costs follow natural gas prices, and I’ve been watching this for a while, as gas prices drop, as electric prices drop into the toilet, i.e., Electric Monthly Update (next one due out Feb. 25, 2013). It’s not just decreased demand sinking the electrical prices, there’s the impact of natural gas prices due to overproduction. In the second tab immediately below, we show monthly and annual ranges of on-peak, daily wholesale natural gas prices at selected pricing locations in the United States. The range of daily natural gas prices is shown for the same month and year as the electricity price range chart. Wholesale electricity prices are closely tied to wholesale natural gas prices in all but the center of the country. Therefore, one can often explain current wholesale electricity prices by looking at what is happening with natural gas prices. This is important stuff — particularly if, indeed, it’s a bubble about to burst. From this spot on the planet, it’s hard to imagine otherwise. World energy consumption has tripled in the past 45 years, and has grown 50-fold since the adventof fossil oil a century and a half ago. More than 80 percent of current energy consumption isobtained from fossil fuels. Per capita energy consumption is highly inequitably distributed. Developed nations like the United States consume four times the world average. Aspirations of growth in consumption by the nearly 80 percent of the world’s population that lives with less than the current per capita world average will cause unprecedented strains on the world’s future energy system. Oil is of particular concern given the geopolitical implications of the concentration of exporters in the Middle East, Russia and West Africa and the dependency of most of the developed world on imports. In the next 24 years world consumption is forecast to grow by a further 44 percent—and U.S. consumption a further 7 percent—with fossil fuels continuing to provide around 80 percent of total demand. Fuelling this growth will require the equivalent of 71 percent of all fossil fuels consumed since 1850— in just 24 years. Recent growth notwithstanding, overall U.S. oil and gas production has long been subject to the law of diminishing returns. Since peak oil production in 1970, the number of operating oil wells in the U.S. has stayed roughly the same while the average productivity per well has declined by 42 percent. Since 1990, the number of operating gas wells in the U.S. has increased by 90 percent while the average productivity per well has declined by 38 percent. The U.S. is highly unlikely to achieve “energy independence” unless energy consumption declines very substantially. The latest U.S. government forecasts project that the U.S. will still require 36 percent of its petroleum liquid requirements to be met with imports by 2040, even with very aggressive forecasts of growth in the production of shale gas and tight oil with hydraulic-fracturing technology. An examination of previous government forecasts reveals that they invariably overestimate production, as do the even more optimistic projections of many pundits. Such unwarranted optimism is not helpful in designing a sustainable energy strategy for the future. Given the realities of geology, the mature nature of the exploration and development of U.S. oil and gas resources and projected prices, it is unlikely that government projections of production can be met. Nonetheless these forecasts are widely used as a credible assessment of future U.S. energy prospects. Future unconventional resources, some of which are inherently very large, must be evaluated not just in terms of their potential in situ size, but also in terms of the rate and full-cycle costs (both environmental and financial) at which they can contribute to supply, as well as their net energy yield. And it continues along this vein in the Shale and Wall Street: Was the Decline in Natural Gas Prices Orchestrated? Shale oil wells are following the same steep decline rates and poor recovery efficiency observed in shale gas wells.The price of natural gas has been driven down largely due to severe overproduction in meeting financial analysts’ targets of production growth for share appreciation coupled and exacerbated by imprudent leverage and thus a concomitant need to produce to meet debt service. Exportation is being pursued for the differential between the domestic and international prices in an effort to shore up ailing balance sheets invested in shale assets. So now that you’ve read these short snippets, think you or anyone else will be putting any money into the gas boom?